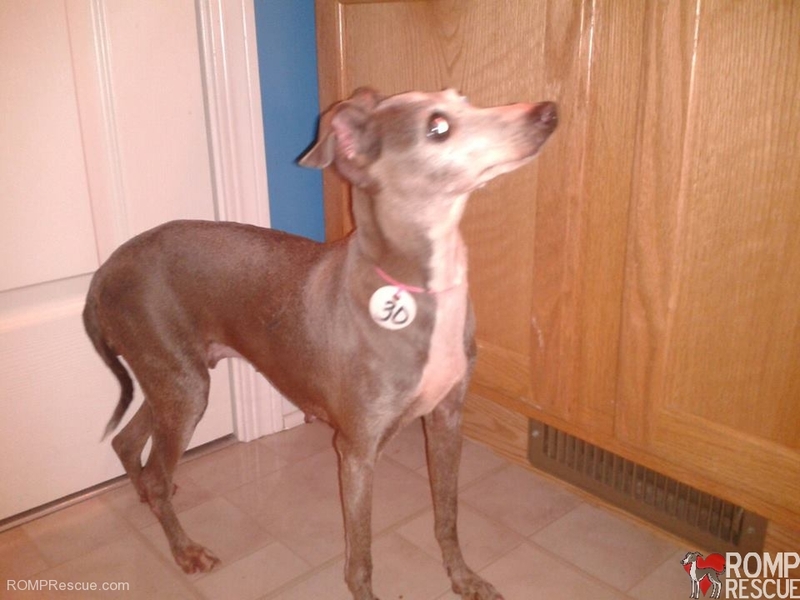 Kai is an Italian Greyhound rescue that came to us from a mill. She was rescued in May and brought with her a surprise, she was pregnant with 4 baby Italian Greyhound boys that were born on June 28, 2013. Despite being in a mill making puppies all her life, she gets excited for treats, wags her tail when her current foster mom walks by, and although timid at first – warms up quickly. She will be in need of a forever family (or another foster family) when she is done weening her litter of pups, around the fall of 2013. Do you have room in your heart and home to help her live out her golden years with love, good food, a warm bed, toys, treats and all the finer things in the life of a pampered pooch? Kai on her transport from the mill to her new ROMP Rescue family! 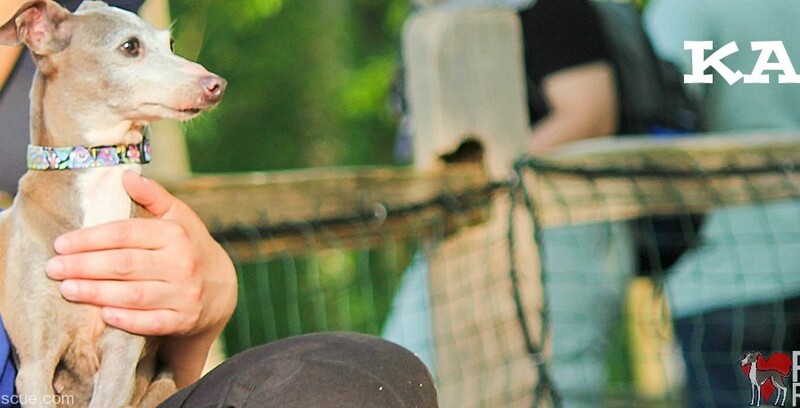 Thank you to the other rescue group that helped us transport her from Missouri to freedom! 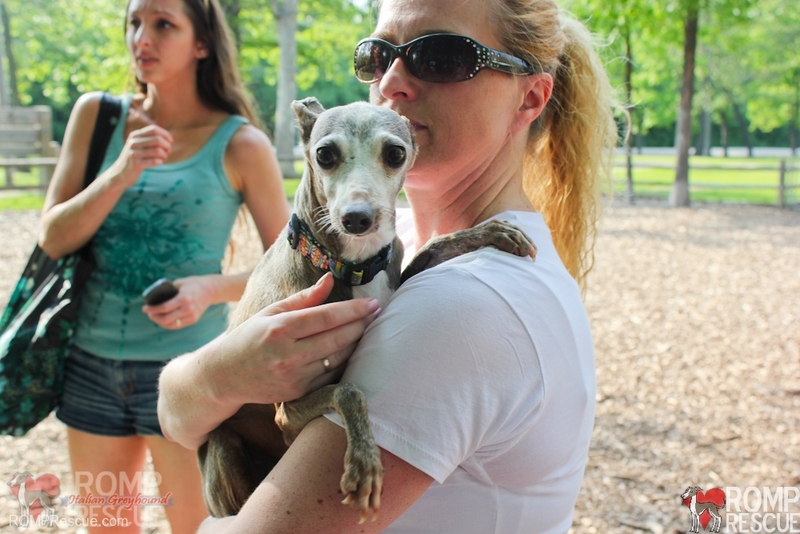 Heather is a volunteer at ROMP Italian Greyhound Rescue and she picked up Kai the Italian Greyhound from the transport and kept her overnight. Here are some photos with her mill tag still on. They knew her as ’30’ we gave her the name Kai. Not knowing where she was or what was going on, she found comfort in the corner of the kitchen at Heather’s home. 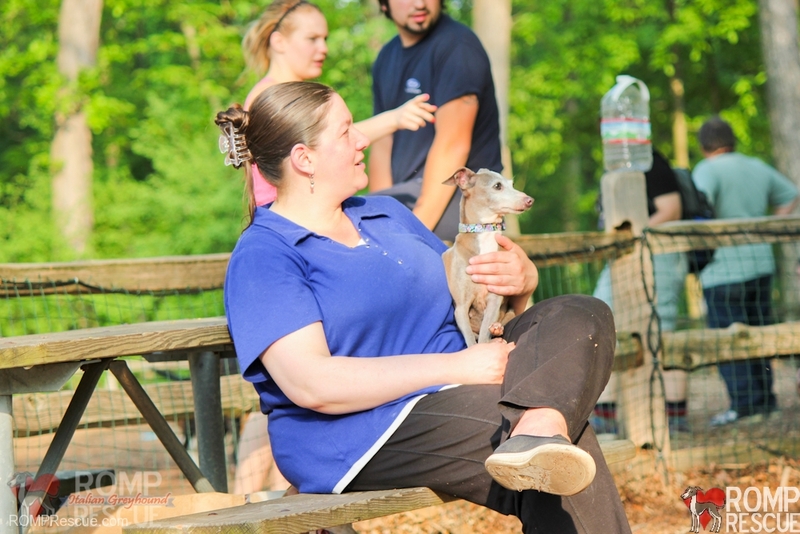 Heather, shown in the photo above, brought Kai to our ROMP Rescue gathering later that weekend. There she was joined with her foster family! This is her first look at the great outdoors! 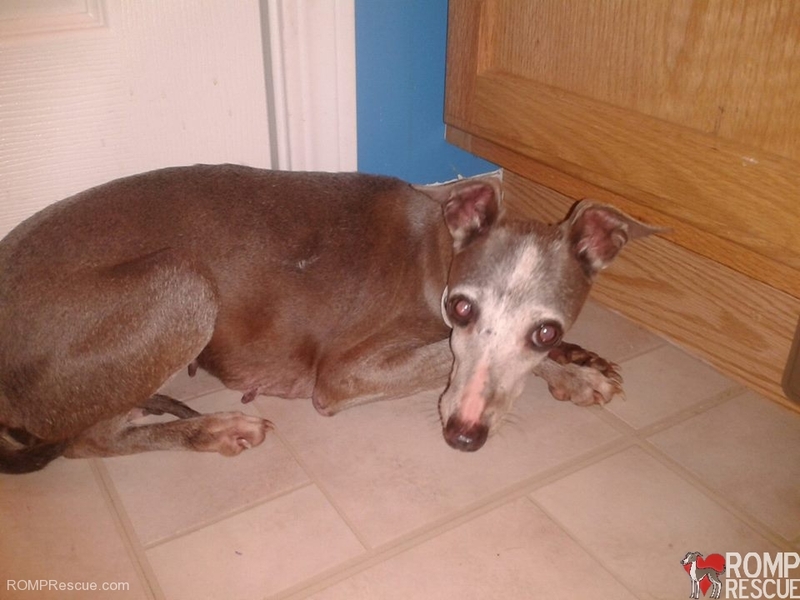 Despite being a normal sized Italian Greyhound when she came to ROMP Italian Greyhound Rescue, her belly started to grow and soon we found out she was carrying puppies! Here is a photo of Kai a week before she delivered! 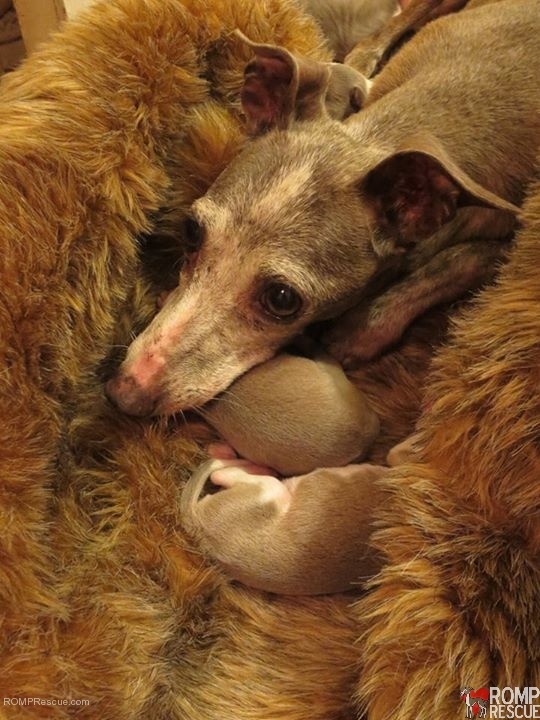 This is the precious Chicago Italian Greyhound with her four beautiful and vivacious little Chicago Italian Greyhound boy puppies! Are you interested in giving Kai the unconditional love, pampering, and amenities she deserves? 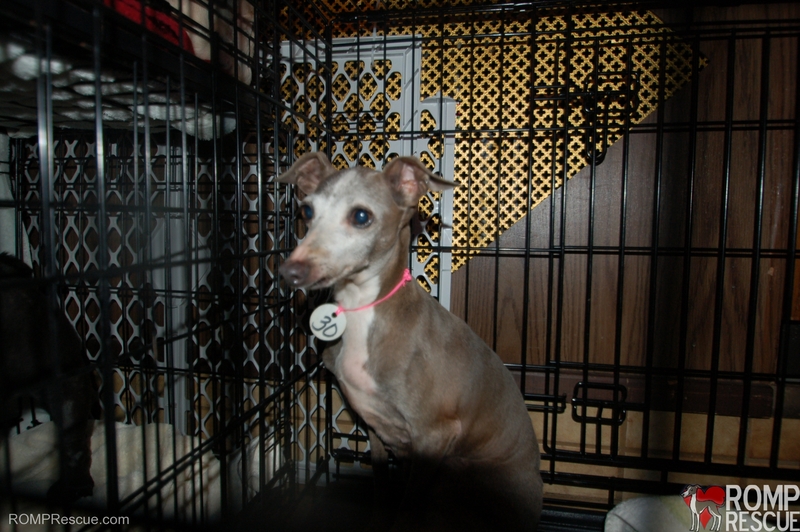 Do you have room in your heart and home to adopt a senior and let her live out her golden years as a spoiled Italian Greyhound? Please contact us and fill out an adoption application or foster application! 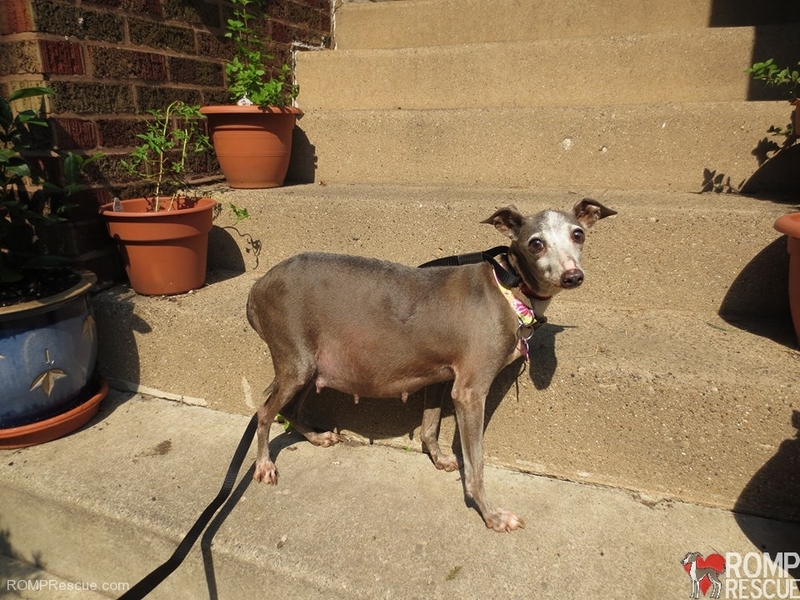 This entry was posted in ALL and tagged chicago dog rescue, chicago ig, Chicago iggy, chicago italian greyhound, chicago itlaian greyhound rescue, chicago mill dog rescue, chicago mill rescue, chicago puppy mill rescue, chicago rescue, chicago senior dog rescue, chicago senior rescue, italian greyhound, italian greyhound rescue, italian greyhounds, kai, puppy mill rescue, puppy mills, saved from a mill, senior italian greyhound. Bookmark the permalink.